Dishwashers save you the time and labour of washing up. Regardless of the size of your kitchen or family, there is a dishwasher to suit your needs. We look at different dishwasher types and outline the features to consider when buying. Freestanding: Slots into any available space and can be used as additional bench area in smaller kitchens. Built-under: Slides under the kitchen bench-top and is usually supplied with a fascia. Semi-integrated: Partially hidden, with the control panel visible and within easy reach. Fully-integrated: Completely concealed behind a matching fascia for a seamless appearance in the kitchen. A dishwasher's capacity is measured by the number of "place settings" it can wash; a place setting is made up of a large and small plate, bowl, cup, saucer, and the cutlery one person would use in a meal. Dishwashers accommodating more place settings are more efficient, as they use less water per item. Even if you don't have a large family, consider a larger capacity dishwasher and load it until it's full. 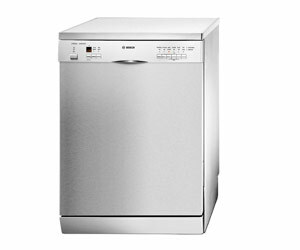 The standard size for a dishwasher is 60cm wide, 82cm high and 60cm deep. Slimline models are usually around 45cm wide and take nine place settings. Measure the available space in your kitchen, and allow some room around the dishwasher for ventilation. Choose a dishwasher that can adapt to your needs. Look for height adjustable shelves, baskets for cutlery, plus racks which protect glasses and can be re-arranged to hold big pots. Check that the racks are made of metal. Light/delicates: For fine china, etc. Glasses: For cups and mugs. Rinse and hold: For very heavy soiling. Rinse-only: For cleaning food leftovers. 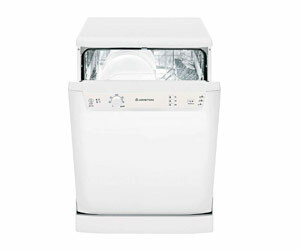 Half-load: For an economical wash (adjusts the water and program times for a less-than-full load). Make sure the controls on your dishwasher are easy to read and reach. Budget models may have mechanical knobs, while newer ones will have digital buttons and display screens. Many machines also have additive indicators on the control panel which will show you when you need to refill the salt or rinse aid reservoirs. Consider how close your kitchen is to living areas, and how quiet the dishwasher needs to be. If possible, find out how loud it is before you buy. At the very least, look for a dishwasher with built-in noise insulation. Residual heat (heat created from the washing process). Fan assistance (removes condensation from inside the dishwasher). Load your dishwasher properly to get the best wash. Generally, the top basket is for smaller, less soiled items and the bottom basket for larger, dirtier pieces. Dishwashers have a filter where food debris gets caught and this should be cleaned regularly. Check how easy it is to reach and remove the filter. Some dishwashers require you to use dishwasher salt (to soften the water); rinse aid (to reduce drying time and leave a smear-free finish); and detergent in powder, tablet or liquid form. Use a dishwasher cleaner regularly to degrease and freshen. Choose a dishwasher with built-in protection against flooding; some top-of-the-range machines will detect changes in water pressure at the top of the inlet hose, and a safety valve will cut off the water supply. Child-safe door locks are a good idea, too.